The “Half Marathon” route will cover more than 65 miles as it winds throughout their legislative districts, stretching from Chicago’s Beverly neighborhood to Orland Park. Cunningham and Hurley will spend approximately 25 minutes at each of the 13 locations, taking time to listen to the concerns of their constituents and answer questions about state government. “I feel this is a unique and valuable way for the people we represent to make their voices heard. With the budget negotiations still going on, I expect we will hear a lot from our residents during this event and we will take those concerns and ideas back with us to the Capitol,” Senator Cunningham said. Representative Hurley came up with the idea for the event while watching runners compete in the annual First Midwest Bank Palos Half Marathon. “That race has become one of the premiere events in my district. It’s a real showcase for our area that draws thousands of runners and spectators,” Hurley said. “I thought a “Coffee and Conversation Half Marathon” would be a good tie-in to help make our constituents aware of how accessible we are. I’m not sure if I can run 13.1 miles in a couple of hours, but I know I can make it to 13 coffee shops in one day. Those interested in meeting Senator Cunningham and Representative Hurley during the event are advised to check their Facebook pages and Senator Cunningham’s twitter account (@SenatorBillC) for live updates on their location. Springfield - Months of work by members of the media and the Illinois General Assembly have culminated in a special report detailing costly administrative practices at our state’s public universities and community colleges. The report brings to light growing administrative costs and generous executive compensation packages that have helped fuel tuition increases for Illinois students. "This report found that many public colleges and universities have been too quick to award lavish benefits to their executives and increase the number of administrative employees they assign to non-instructional post," State Senator Bill Cunningham said. "While these practices are never welcome, they are particularly troubling during difficult budgetary times and when college tuition rates have grown faster than any other expenses faced by middle class families." 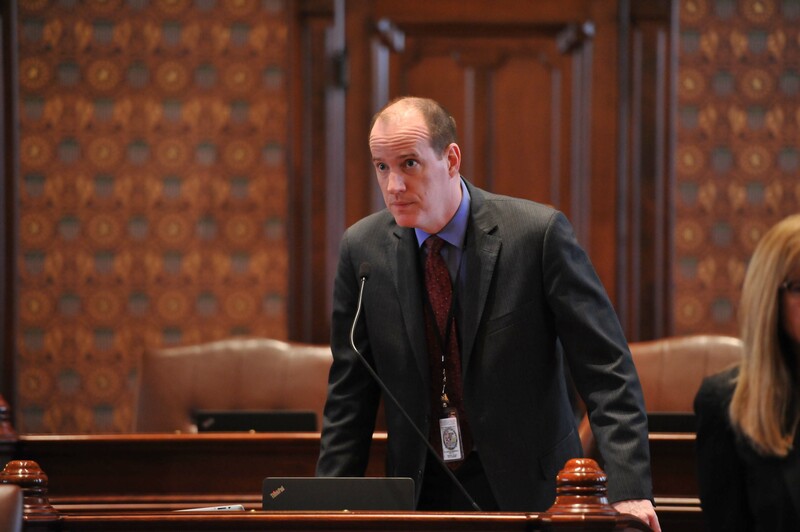 The initial draft report was issued by Senator Cunningham, who chairs the Illinois State Senate’s Higher Education Sub-committee on Executive Compensation. According to the report, presidents at public universities in Illinois often receive cash bonuses, country club memberships, and housing and vehicle allowances, this despite enjoying a median salary of nearly $300,000 a year. “When you look at the numbers in this report, they indicate a trend of bloated administrations at our public universities and community colleges. If the General Assembly is going to invest more in higher education, we want to insure those investments are going directly into the classroom and not to more administration,” Senator Cunningham continued. The special sub-committee was assembled and began work after a series of media reports detailing questionable contracts and severance packages for administrators at the College of DuPage in Glen Ellyn and at Illinois State University in Normal. The report covers public higher education institutions across the state and found similar instances of opaque negotiations, contract extensions approved without discussions and issues dealing with pensions, such as excessive sick-day buyouts. The report goes on to explain possible reforms to limit these practices, including reforms to the Open Meetings Act as well as auditing reforms. “I don’t think we are proposing anything too radical here. I think it’s mostly commonsense reforms that we are seeking here. Over the summer, we will have a series of hearings to take a closer look at the report and discuss proposed reforms,” Senator Cunningham said. Please take a moment to read the report at the Illinois Senate Democrats website. 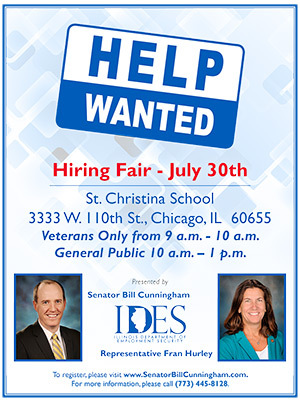 SPRINGFIELD — State Senator Bill Cunningham (D-Chicago), along with State Representative Frances Hurley (D-Chicago) and the Illinois Department of Employment Security are holding a Hiring Fair on Thursday, July 30. Doors open for veterans only starting at 9:00 AM. The general public is invited from 10:00 AM until 1:00 PM. The workshop will be held at the St. Christina School, 3333 W. 110th St. in Chicago. The hiring fair will help provide employers the chance to meet prospective employees, help those prospective employees find work along with other opportunities. Job seekers may register here.